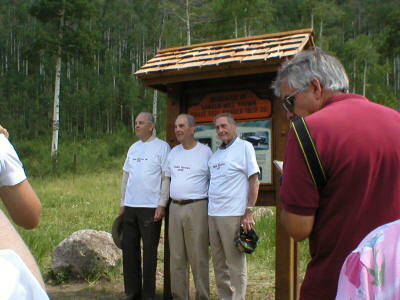 On July 23, 2005, the Brown Family, descendants of William Sears and Myrtle Brown, gathered in Yeoman Park, Colorado for a reunion and to celebrate the Dedication of "Brown's Loop" -- a Nature and fishing trail. William Sears (Ranger Will) Brown was a pioneering Forest Service ranger from 1920 through 1935. More information can be found on the Articles page. Originally designed to share information on the this Park, and the Fahl, Brown, Osthoff family, these pages continue to expand and now include information on any ancestors of Colorado Joshua Brown (my kiddo), which include, but are not limited to, Wallis, Cantrell, Miller, Wallace, Pratt, Franklin, etc. (Many pages are password protected for family access only. Contact me if you need the password.) Also, please send me anything you would like included on these pages (stories, photos, links). Special Thanks again to Wayne S. Brown for all the hard work, coordination, research, dedication, and great t-shirts!